I put this on the list because I cannot think of many environments less appealing to enter than this. Noisy, dark, fast moving, requiring physical coordination, and crawling with excitable squealing children, on wheels, in a confined space, that I would then be unable to leave, until the bitter end. To compound my horror, my sister in law had found one that we could go to, at lunch time, on one of the most gloriously hot and sunny days of the year so far. Ideal! So I went with extraordinarily low expectations. And was pleasantly surprised! In many ways the event was every bit as awful as I imagined, but there was a surprising amount of pleasure in it nonetheless. We took my 3 daughters and 2 nieces, all aged from 4-6, and they managed startlingly well! The first round was challenging, due to the incompetence of our entire party. We stumbled and fell and dropped one another, and bumped into people, and took out small children by mistake. But with each circuit, there was a marked improvement. Basically a disco is blaring, and lights are flashing, but you can still see pretty clearly due to the daylight flooding in through every window. Everyone skates round the edge of the sports hall, all in the same direction, (a worthwhile precaution, though collisions were still frequent). 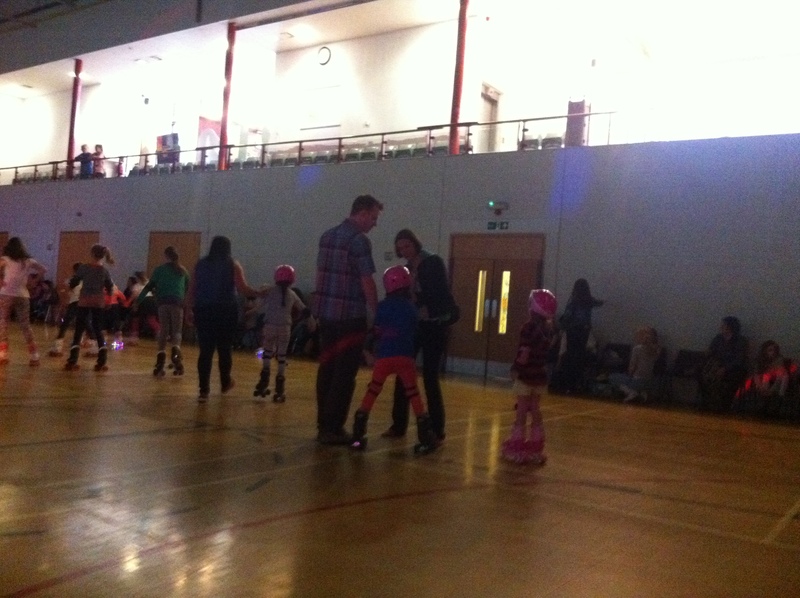 There were kids from about 4 up to teens, boys and girls, some with kit that suggested they were regulars – flashing skates, legwarmers and the like. My children were all in the wrong style of skate, with knee and elbow pads and helmets on, all of which betrayed a certain lack of experience. I wish I had words or video to convey the hilarity of Rosie’s movement around the hall. Her legs were going back and forth as if she were running for dear life, yet she moved forwards barely at all. But she went round and round and round, hardly stopping in the whole hour and a half. Desperately trying to catch up with her older cousin, but being lapped, time and time again. The youngest niece was like a newborn foal on wheels, if you can picture such a thing – a mass of limbs in all directions, but she didn’t seem troubled by it! 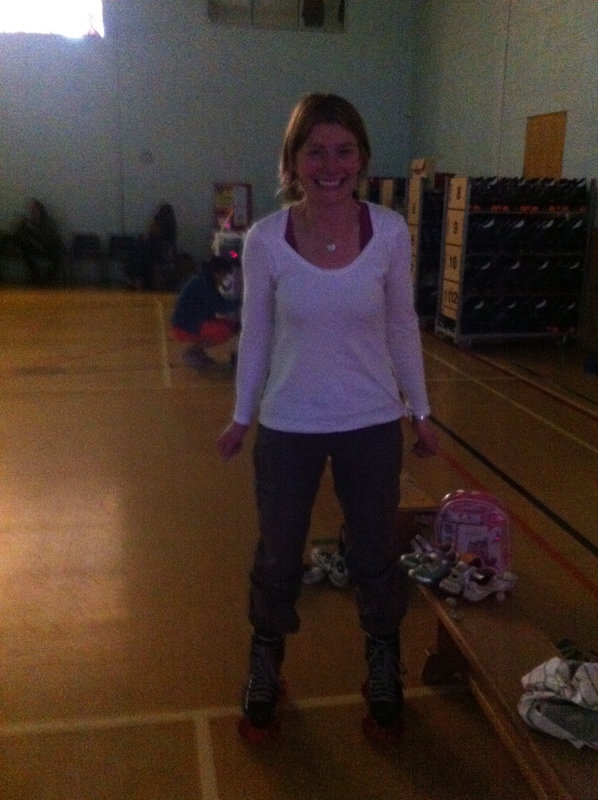 And of course I had to have a go myself. And doing that actually gave me a new respect for my children. Because it was a little bit scary, to find myself out of control, in a roomful of people, looking like a prize knob, and unable to propel myself where or how I wanted! I was wobbly and crap and fell over and it was all rather difficult! and not at all pretty! And I thought, I am doing this once, in a deliberate attempt to challenge myself, which is of my own choosing, and afterwards I’m going to need a good sit down with a cup of tea to get myself together again. Yet I put the kids in this situation 4 or 5 times most days, of being pressured to try a thing that they don’t think they can do. Try this climbing frame (higher than you are comfortable with), walk this dog (even though you are scared of them), read this book (full of words you don’t know), say thank you to this person (who you are terrified to address), say something in French (when you are plainly intimidated), play with this child (who you have never met before)…. And they have no choice, and 9 times out of 10 they do just get on with it. And each time the attempt goes wrong they have to bounce back from it instantly, only to get hit with something else. No wonder they are exhausted by tea time most days! Respect!